Is there anything better than a good cup of coffee and a notebook first thing in the morning? I'm thinking not. I am a morning person. I like to wake up before the sun hits the horizon. When the world is still fresh and full of possibilities. In the desert this is practical during the summer, it's the only time of day that doesn't feel like death outside. And let's face it, I like being outside. Bare feet in the dew soaked grass. Cool breeze ruffling my newly shortened hair. Bliss. Today I write this from an even wider sense of new possibilities. Yesterday I made another in a string of major decisions that have been coming over the past few weeks. I'm switching career fields. I'll be going back to school in the spring. I'm refocusing my priorities. When I stop and think about it I feel like I should feel overwhelmed or worried, but that couldn't be further from the truth. I'm so bursting full of joy I can hardly contain it. I can't keep the smile off of my face. I want to hug everyone. I'm sure it's obnoxious. But as someone who has always felt 'wrong' this feeling is glorious. For the first time in at least eight years I can look in the mirror and smile at the person looking back at me. I'm learning to be kinder to myself. To remember that I am God's creation, not a mistake. Thankful. I think that word wraps up how I'm feeling, if that feeling needs to be bottled up and labelled. I'm immeasurably thankful for God's hand in my life. For the people that have been put in my path. For the journey. For fresh starts. 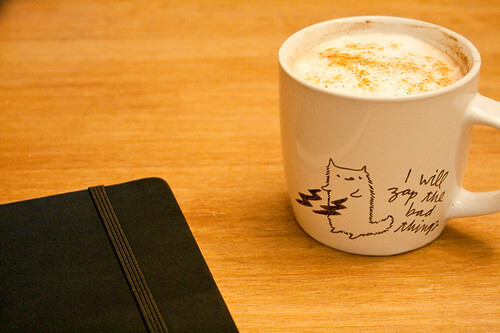 Today that fresh start tastes like a caramel cinnamon latte. I'm not going to give you a recipe for the latte itself because that's all about personal preference. I will, however, give you the caramel sauce recipe in its exactness because it is creamy deliciousness and you will want to put it on everything. In case you do want my latte preparation method, I will give it to you as best I can. I use a small french press (one suitable for a single serving) and dark roast coffee. Always dark roast (at the moment, that is the French roast from Fresh&Easy). While that's brewing I scoop a spoonful of caramel and a sprinkle of cinnamon into a mug, stirring in the hot coffee as soon as it's ready. Now, when I'm being lazy I'll just pour in some skim milk and call it a day. Today I was feeling a little fancy so I used my manual milk froth-er to foam the milk instead. I spooned it on top and sprinkled the foamy peaks with a little more cinnamon. In a saucepan combine the sugar and water and cook over medium-high heat, swirling occasionally. Don't step away from the stove because this whole process moves quickly and trust me, you don't want burnt caramel. Continue to let the mixture bubble away until the sugar is dissolved and it starts to turn a golden amber. Be careful to not let the sugar darken too much! Remove the pan from the heat and stir in the heavy cream, stirring as you go. Return the pan to the stove and continue to cook at medium-high heat for 3-5 minutes. The goal here is for all of the caramel to dissolve into the cream and for the sauce to thicken. Stir in the splash of vanilla extract. Pour the sauce into a bowl and set aside for it to cool. Finished sauce can be stored in an airtight container in the refrigerator for up to a week.